AMERICAN HONEY is as close to guileless as film can be, in its shots, its editing, its acting, its casting. It shakes you awake with its freshness. 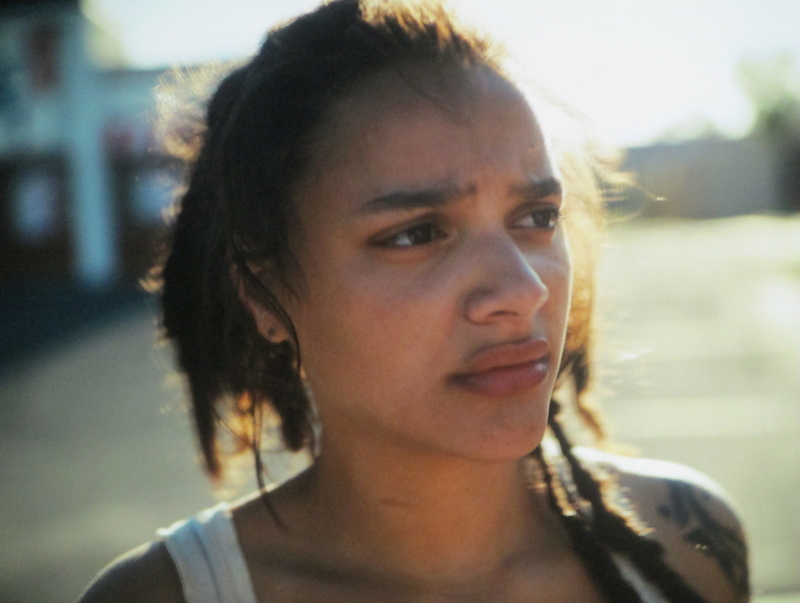 Sasha Lane, plucked off a beach by the director Andrea Arnold to play the lead, is an instinctive talent whose craft seeps from her bones on its own accord. She’s born to the camera and inhabits Star, a 18-year-old from Texas who hits the road to change her life, like a second self. She’s first seen scavenging for things of use with a couple of kids; they find a frozen chicken, still in the commercial wrapping, in a dumpster. They make their way to a K-Mart to get them some Mountain Dew, where she meets Jake (Shia LaBeouf), feels a charge between them, and leaves, despite dismissing his proposition of “a job in Kansas City,” with the address of a Motel 6. The kids and she make their way home, where she stuffs the fridge with their haul. The man of the house enters and alters with three words our whole sense of Star’s situation. By dawn she’s raising her head from a backpack in the parking lot of the Motel 6 and gets induced into a band of itinerant magazine sellers led by the vixen-like Krystal (Riley Keough). Jake is her trainer, cheap motels her home, and a rolling van her way forward. That this can’t possibly be a legitimate operation isn’t raised nor suspected by anyone in the film. The casting of Lane is identity neutral, her ethnic ambiguity never a factor in how Star is perceived. She’s as white trash – the film’s words, not mine – as the rest of them. Arnold, perhaps because she is British, goes right to class as the most important qualifier. It pervades the great swath of the American midlands that Star covers, from Texas to Kansas City (where the tall buildings make her eyes widen), to the badlands and boom towns of the Dakotas, from the dull affluence of big houses to the livelier squalor of places where trash worse off than she, without the future she “dreams” of, are wadded up and left for good. Arnold’s eye finds – her cinematographer is Robbie Ryan – the discomfiting nostalgia of the North American road, the hard truth behind the picturesque image, the perverse glamour of exploited lands and discarded peoples. The indifference with which human beings are tossed aside by their own species, to biodegrade in the muck of inequality, has, in this film, a politics profounder than the polemical. It does not oppose activism (in fact, it could prompt it), but promotes the individual act, compassion in an ecosystem that sees no division between humans and animals. Star spends much of what little she has on an act of human charity, but there isn’t a kind toward which her empathy doesn’t trend. She saves an insect and liberates a turtle, shares the sadness in the eyes of a cow, leaves the frozen chicken for the dog, has a moment with a beast. The biodiverse cast includes a flying squirrel and a man who howls like a wolf. The magazine sellers roam freely by day and rejoin at night as though in response to a homing instinct, like bees returning to the hive or pigeons to the roost. Their parties are primal and crude; they take strength, like Kipling’s wolves, from the pack, and the other way around. Star stands from them a little apart, wary, not quite of the tribe. Jake too is a bit of a free agent. She’s repelled by the lies he tells, but prey, when they are unobserved in the open air, to the shared urgency of an animal desire.